Every once in a while I see a show that makes me feel good, even hopeful about this overheated, self-aggrandizing, status-obsessed art scene in New York. Chroma Botanica: Ellie Irons & Linda Stillman was such an exhibition for me. It’s charming and inquisitive, imaginative and investigatory. It takes plant life both as an object of scientific investigation, and as an aesthetic jumping-off point. I mean, we have been told that there are two antipodean hemispheres in the brain: the creative and the analytical. 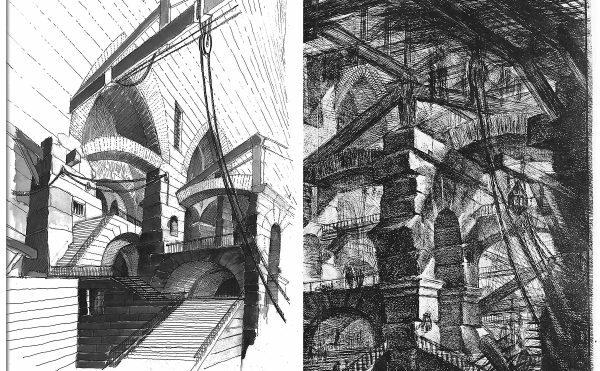 In this show you get both and these two projects don’t seem nearly so opposed. 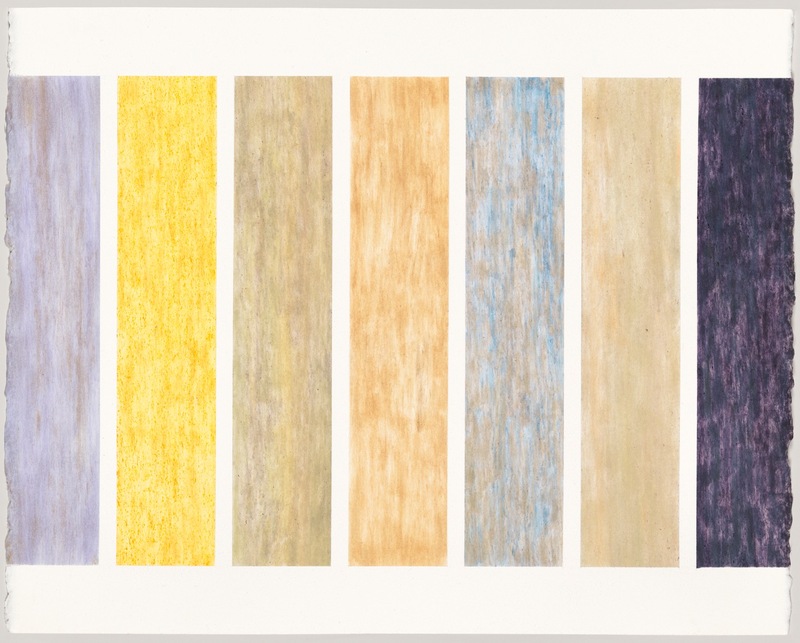 There are lovely, elegant drawings made by Stillman that are produced by her rubbing flower petals onto paper, thus leaving color behind, as well as some of the actual material. 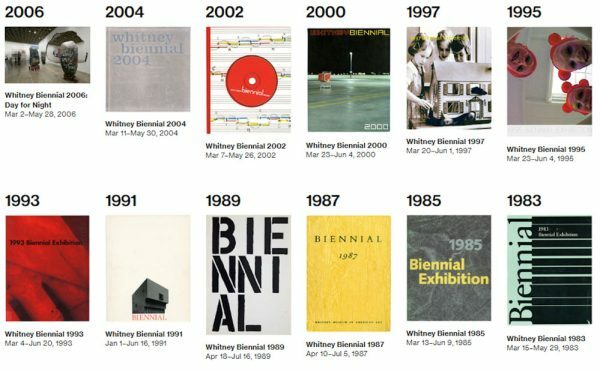 Stillman makes these drawings abstract shapes like “Reservoir” (2015) and “Shakespeare Garden” (2015), or they can be structured like a flag “Field Trip” (2015), “Central Park colored” (2015), or geometric shapes that also convey the colors associated with the various species, as with “Conservatory Garden: Collate” (2016), and “Conservatory Garden: Collect” (2016). The series comes out Stillman’s work last summer with the Central Park Conservancy, gathering pruned flowers from the Shakespeare Garden and the Reservoir area. It’s delicate work that radically reinterprets flowers and yet retains a crucial aspect of them; it’s like hearing a familiar voice speaking in a different language. Irons also varies her approach to visual representation. 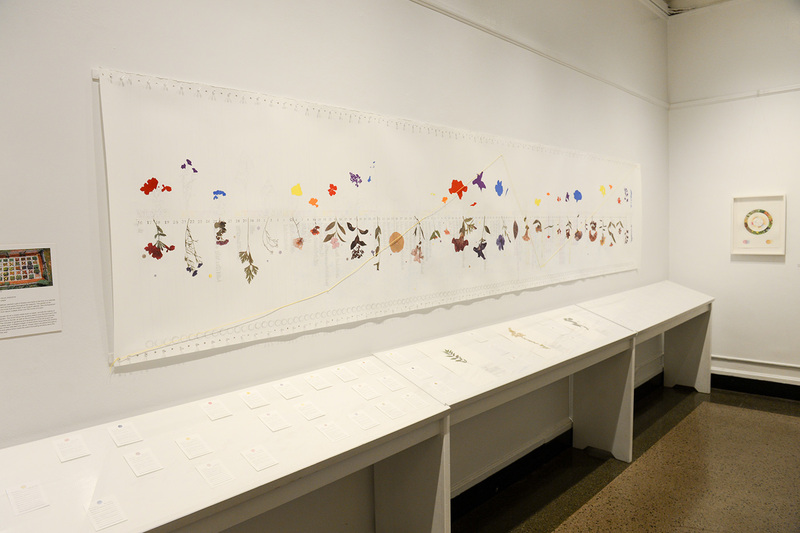 There are non-figurative and geometric paintings like “Dot Array: Weeds and Herbicides” (2016), “Invasive Pigments Color Wheel” (2015), “Dot Cluster: Wild Plants Common in New York City” (2016). However Irons seems a bit more interested in using the work to map the growth and spread of weeds, and using these pictorial maps to instruct. 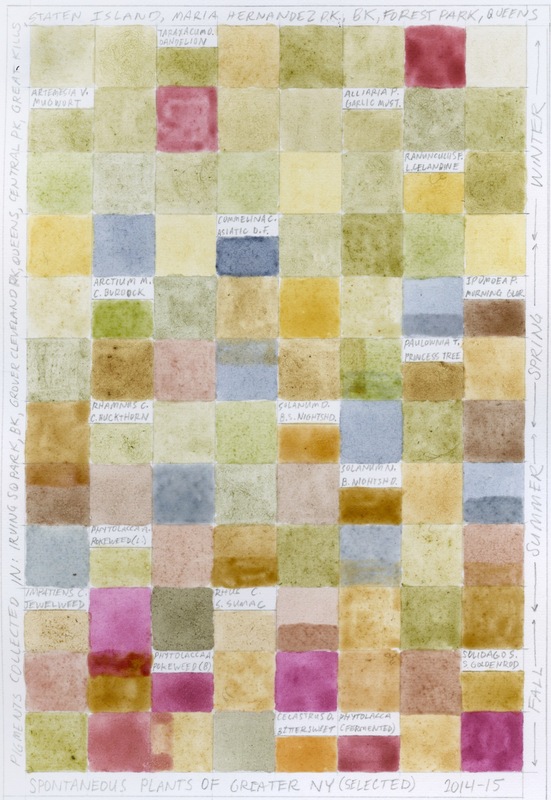 She has collected “unintentional” plants from her Brooklyn neighborhood and ground down their leaves, flowers and berries to create pigment for her watercolor paint. (As part of the exhibition, she demonstrated the process at a public talk in the Central Park’s Arsenal Gallery.) Irons is focused on the migration and proliferation of these plants and she assiduously charts their movements in works like “Invasive Pigments: Oriental Bittersweet (Celastrus orbiculatus) American Range (2013) which shows the eastern half of the country filigreed with tendrils and vines of varying hues that make the world look more alive than any other drawing I’ve seen. 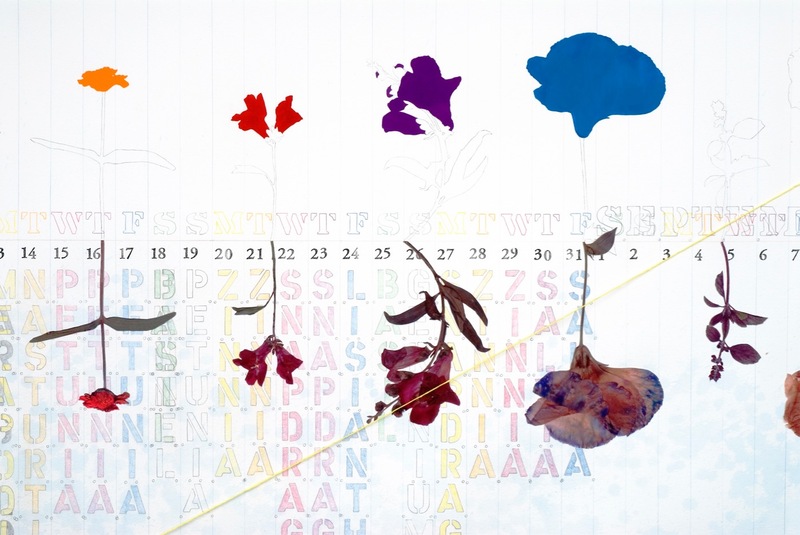 “Phenological Clock” (2014) is similarly a work that looks very labor intensive, the small handwritten script giving the Latin names and where they originated and where they have infiltrated. And if, like me, you love the sound of the Latinate terminology, then you’ll be pleased to read about Verbena, Salvia, Dahlia, Fuschia, Aster oblongifolius, and Rudbeckia fulgida. I’m always surprised that something could actually have been named with such a name. 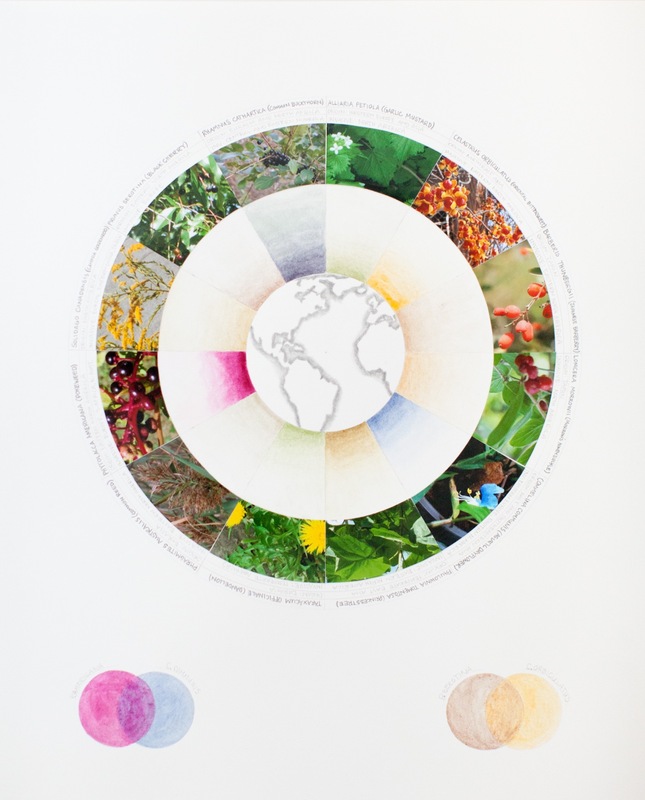 Ellie Irons, “Brooklyn Transect: Wild Plants May-September” (2015-16) graphite and plant pigments on paper. An added bonus is that the show is off the beaten track of the typical gallery locales of the Lower East Side, Chelsea, West 57th, and Williamsburg. 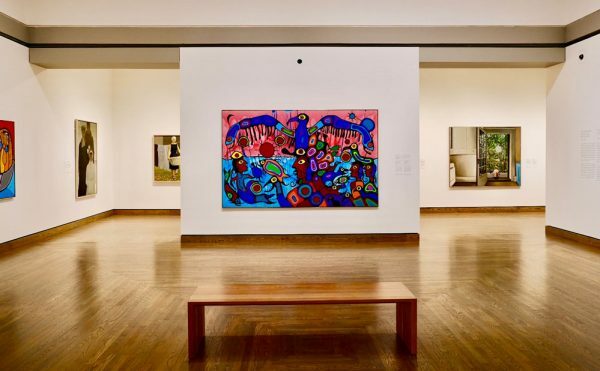 Instead, it’s located in Central Park, near 64th street in the Arsenal Building, on its 3rd floor gallery, just a few feet from the entrance to the Central Park Zoo. The gallery is still a white room, but somehow off because of its municipal feel. To the right of the gallery’s entrance is a small gate and two windows that reveal a couple Parks department personnel working at their computers. In fact, the whole time I was there several workers walked back and forth through the gallery, seemingly going on their typical journeys from office to office. Chroma Botanica is a graceful show, full of lived life and studious investigation and dead plants and the colors they given in what’s best understood as complete generosity. 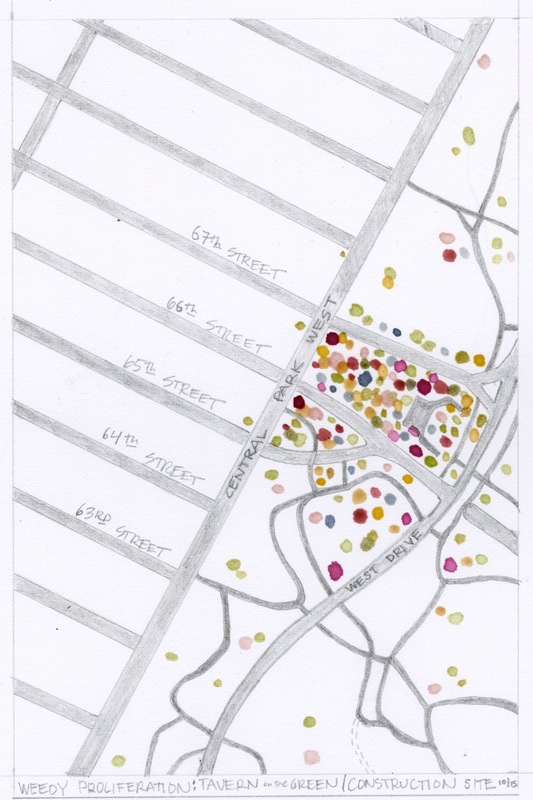 Ellie Irons, “Spontaneous Plant Clusters (Central Park West, Tavern on the Green construction site, September 2015)” (2016) graphite and plant pigments on paper. 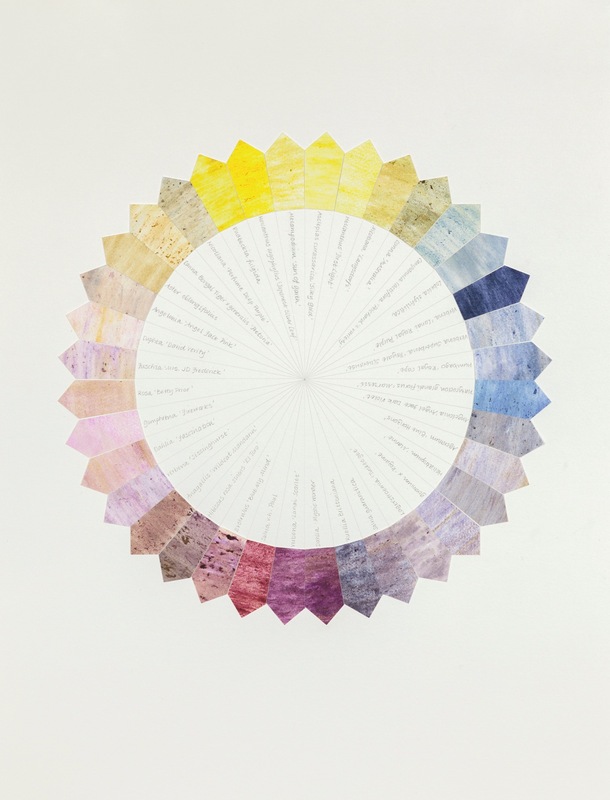 Ellie Irons, “Color Wheel (Greater New York City) (2013) graphite, collage and plant derived pigments on paper. 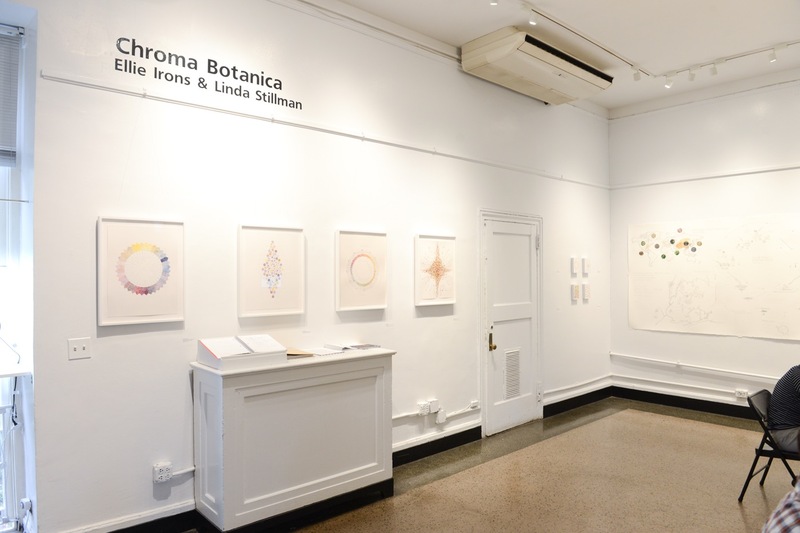 Chroma Botanica: Ellie Irons & Linda Stillman continues at the Arsenal Gallery in Central Park (830 Fifth Avenue, Central Park, Manhattan) until June 15.